I live on the 1300 block of Belmont St, NW. My question comes at a particularly relevant time in DC vehicle usage. 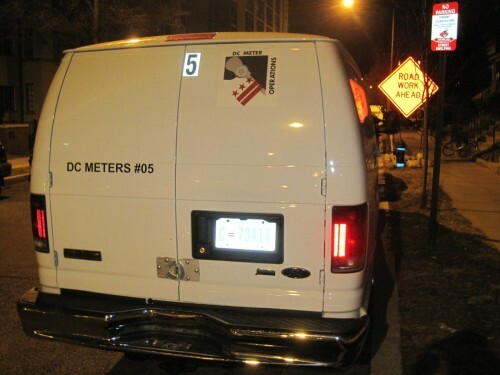 There is a large “DC Meters” van that parks on my street overnight. It’s huge and it takes up a lot of very precious parking. The fact that it’s there overnight and gone during the day leads me to believe that someone who works for the city is using this city vehicle as a personal vehicle as well. So, is there a special lot that these vehicles should be parked in overnight? How do I tell if the driver of this van is abusing their “power”? Hmm, I think some DC jobs (no I’m not talking about that one) allow their workers to drive vehicles home. Anyone else ever hear/see that as well? Do you think “non essential” employees should be able to drive DC vehicles home?